Henryk Goldszmit had become a Polish icon in the 1930s through his writings, teachings, and radio programs for children, under the name of Janusz Korczak. However anti-semitism is on the increase and Korczak’s radio show is stopped, but he remains defiantly optimistic. 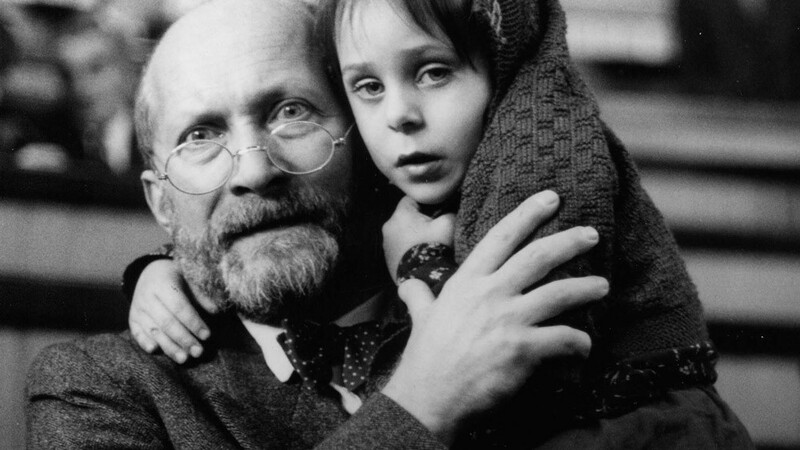 After the Nazis invade Poland, the Jewish Korczak and his orphans are moved into the newly formed Ghetto, where he scrounges for food and tries to protect the children from the violence and hunger around them. He refuses offers of favourable treatment or escape in order to remain with the children. When the orphanage is deported to Treblinka, he refuses final offers to escape and accompanies them to their deaths in the gas chambers. Film and theatre director. He is a graduate of the Academy of Fine Arts in Kracow and the Film School in Łցdź. Senator of the Republic of Poland from 1989 to 1991. Received numerous awards and prizes, including: BAFTA Fellowship 1982; Onassis Prize, Greece 1982; Officier of the Légion d'Honneur (1982) France; Cesar Award, France (1983); Pirandello Artistic Award, Italy (1986); Kyoto Prize, Japan (1987); Felix European Film Awards- Lifetime Achievement Award (1990); Order of Rising Sun, Japan (1995); Premium Imperiale, Japan (1997); Golden Lion Life Achievement Award, Venice, (1998); OSCAR Academy of Motion Picture Arts and Sciences - Lifetime Achievement Award (2000); Commandeur de la Légion d'Honneur France (2001); Golden Bear Life Achievement Award, IFF Berlin (2006). The Bad Boy (1950), The Pottery at Ilza (1951), While You’re Asleep (1952), A Generation (1955), I Walk in the Sun (1955), Kanal (1957), Ashes and Diamonds (1958), Lotna (1959), Innocent Sorcerers (1960), Siberian Lady Macbeth (1961), Samson (1961), Love at Twenty (1962), Ashes (1965), Everything for Sale (1968), Roly Poly (1968, TV), Gates to Paradise (1968), Hunting Flies (1969), The Birch Wood (1970), Landscape after the Battle (1970), Pilate and Others (1972), The Wedding (1973), The Promised Land (1975), The Shadow Line (1976), Dead Class (1977, TV), Man of Marble (1977), Rough Treatment (1978), Einlandung zur Besichtigung von Innenraumen (1978), Pogoda domu niechaj będzie z Toba (1979), The Maids of Wilko (1979), As Years Go by, As Days Go by (1980, TV series), The Orchestra Conductor (1980), Man of Iron (1981), Danton (1983), Love in Germany (1983), A Chronicle of Amorous Accidents (1986), The French as Seen by... (1988, TV mini-series), The Possessed (1988), Korczak (1990), Schuld und Suhne (1992, TV), The Ring with a Crowned-Eagle (1992), Nastasja (1994), The Holy Week (1995), Miss Nobody (1996), Pan Tadeusz: The Last Foray in Lithuania (1999), The Condemnation of Franciszek Klos (2000, TV), June night (2001, TV), The Lesson of Polish Cinema (2002), The Revenge (2002), Solidqarność, Solidarność (segment Man of Hope, 2005), Katyń (2007), Sweet Rush (2008), Kręć! Jak kochasz, to kręć! (2010, doc. ), Wałęsa. Man of Hope (2013).